A former slave and a self–made businessman who lost property during the Civil War, Benjamin Turner focused on restoring peace and repairing economic damage in the war–ravaged South. The first African–American Representative from Alabama, Turner tirelessly promoted the industriousness of his black constituents. “These people have struggled longer and labored harder, and have made more of the raw material than any people in the world,” he noted on the House Floor. “Since they have been free they have not slackened in their industry, but materially improved their economy.”1 Turner also struck a conciliatory tone with white constituents, seeking restored political rights for former Confederates before Congress passed laws declaring general amnesty. His political moderation limited his legislative influence in an institution still controlled by Radical Republicans. Having witnessed firsthand the devastation of the Civil War, Turner spent much of his congressional career seeking financial aid for his broken southern state. In one instance, he introduced a bill to eliminate legal and political disabilities imposed on former Confederates. Though the Radical Republicans in the 42nd Congress denied his request, the 43rd Congress (1873–1875) eventually passed an Amnesty Act, clearing most former Confederates’ political restrictions. Turner’s charity toward former slave masters did not prevent him from taking a more radical stance on other legislation concerning the injustices of slavery. He advocated racially mixed schools and financial reparation for former slaves; years later, both issues remained controversial. On February 20, 1872, Turner presented a petition from the Mobile board of trade requesting a refund of the taxes on cotton collected from the southern states from 1866 to 1868. On May 31, he submitted a speech to the Congressional Globe Appendix, declaring the tax unconstitutional and decrying its effect on the impoverished cotton workers—a disproportionate number of whom were freedmen. He pleaded “on behalf of the poor people of the South, regardless of caste or color, because this tax had its blighting influence. It cut the jugular vein of our financial system, bled it near unto death.… It so crippled every trade and industry that our suffering has been greater under its influence than under that of the war.”10 In the same speech, Turner called for the government to purchase private land, divide it into tracts of no more than 160 acres, and sell it to freedmen. No action was taken on this proposal, nor did the House consider a refund for the cotton tax. After his congressional career, Turner curtailed his political activities, emerging in 1880 to attend the Alabama Labor Union Convention and to serve as a delegate to the Republican National Convention in Chicago. He then returned to his livery stable in Selma. Turner eventually lost his business during a national economic downturn at the end of the 1870s. Resorting to making his living as a farmer, Benjamin Turner died nearly penniless in Selma on March 21, 1894. 1Congressional Globe, Appendix, 42nd Cong., 2nd sess. (30 May 1872): A530–531. 2Turner’s parents’ names are not known. 3William W. Rogers, “Turner, Benjamin Sterling,” American National Biography 22 (New York: Oxford University Press, 1999): 9–11 (hereinafter referred to as ANB). 4Rogers, “Turner, Benjamin Sterling,” ANB. 6Stanley B. Parsons et al., United States Congressional Districts, 1843–1883 (New York: Greenwood Press, 1986): 93–94. 7Rogers, “Turner, Benjamin Sterling,” ANB. See also Michael J. Dubin et al., U.S. Congressional Elections, 1788–1997 (Jefferson, NC: McFarland and Company, Inc., Publishers, 1998): 217. 8Congressional Globe, Appendix, 42nd Cong., 2nd sess. (30 May 1872): A530–531. 9Private bills are bills introduced on behalf of an individual, typically a constituent. 10Congressional Globe, Appendix, 42nd Cong., 2nd sess. (31 May 1872): A540–541. 11Rogers, “Turner, Benjamin Sterling,” ANB. 12Quoted in Eric Foner, Freedom’s Lawmakers: A Directory of Black Officeholders During Reconstruction (New York: Oxford University Press, 1993): 215. 13Dubin et al., U.S. Congressional Elections, 1788–1997: 223. 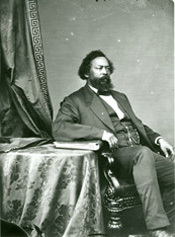 "Benjamin Sterling Turner" in Black Americans in Congress, 1870-2007. Prepared under the direction of the Committee on House Administration by the Office of History & Preservation, U.S. House of Representatives. Washington: Government Printing Office, 2008.